At Park Elementary we are vowing to "Be the One" who makes a difference in our school, community and in society. 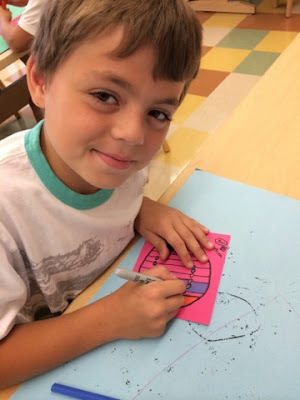 We did a school wide collaborative project to kick off the start of the school year tying-in with this years school wide theme of being the one based on the book "One" by Kathryn Otoshi. 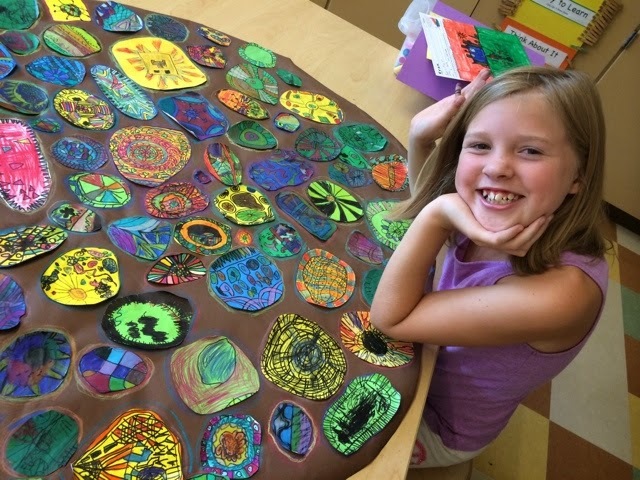 K-5th graders created their own little piece to become part of the whole. This represents all of us coming together in our school community and being united. 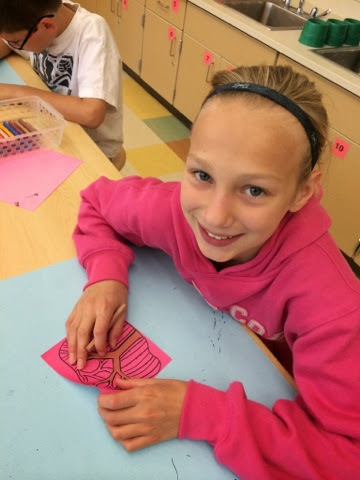 We looked at and talked about Lea Anderson's art and examples of upper elementary students art from another blog. 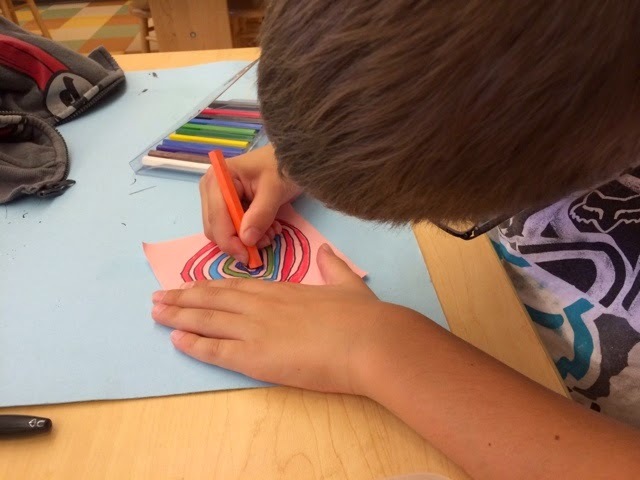 Each child started with an organic or round shape filled with pattern and designs to represent them as a part of a whole in this collaborative project. With the repetition of color and shape they created visual unity. The variety of designs is what added interest - just as the unique things about ourselves makes us interesting and special. We can create unity at school and beyond by being the 1 who is caring, respectful, loyal, honest, responsible and fair. Our Park family is special because WE ARE ONE! Enjoy the art in the halls as we build unity this school year. 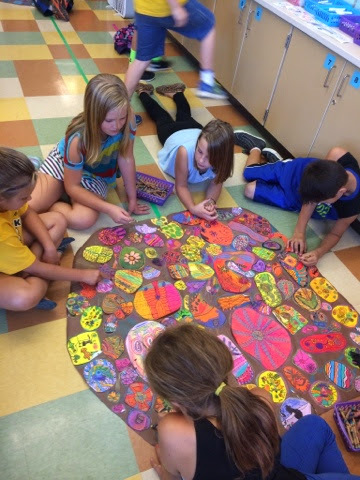 We talked about creating unity with our art as a class and as a school. We talked about and defined the meaning of "Unity" which is "all working together, all parts belonging and all in harmony". We had T-shirts made with our theme on them. 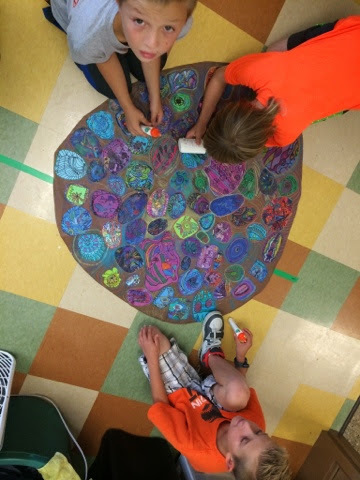 Each grade level has a different color that matched their part of the collaborative art project. Last week, we decided to take the opportunity to do an all school picture in our shirts. 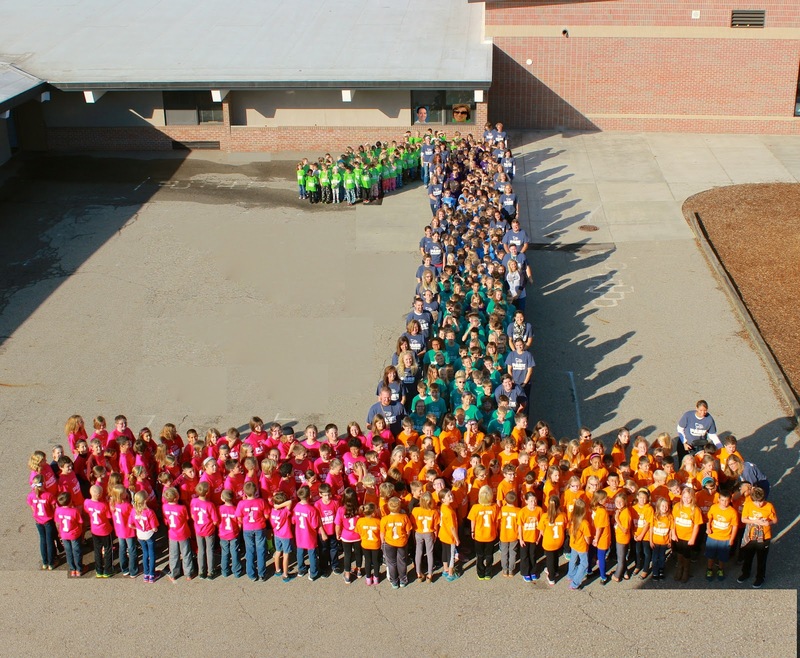 We attempted to create the number 1 with all the students and staff. This picture serves as an amazing visual representation of how beautiful it is when we all work together in accomplishing one goal! We are vowing to "Be the One" who makes a difference in our school, community and in society. Nice idea Mrs. Anderson! LOVE the Human 1 ! !